2. There’s no one best way to implement a dynamic system of public schools. Washington D.C. and Newark have dual public education systems comprised of traditional district schools and charter schools, yet D.C. is under mayoral control and Newark was under state control but is now governed by an elected school board. Camden has 15,000 students and a neighborhood charter takeover model with relaxed accountability. New York City has 1.1 million students and moved quickly to give autonomy to all its schools and hold them accountable, while phasing out large failing high schools to make room for new small schools of choice. Denver Public Schools saw consistent leadership from an elected school board and single superintendent for a decade. Radically different school systems implementing a common strategy to suit their local contexts speaks to the “portfolio” model’s flexibility. Local leaders can customize the approach to their particular moment in time, political climate, incoming assets, and challenges. 3. There are two general implementation approaches: “move fast and break things” and “slow and steady.” One glaring takeaway from the Eight Cities project is that seven of the eight cities are or were under state or mayoral control when the strategy was being implemented. In general, leaders in these governance arrangements tend to make drastic changes quickly while administrations have control. While a lot can be accomplished quickly, this approach can also foster blowback from ostracized constituencies and can risk being rolled back when systems are returned to local control. Our New York City and Oakland stories illustrate that. The alternative approach demonstrated by Denver is to build a new system slowly and steadily under a locally elected school board with the support of vital constituencies such as teachers’ unions and community-based organizations. While this has the benefit of sustained progress, it also runs the risk of slow incremental change when urgency is required. Either approach can work. Both have risks and benefits. 4. No one had a master plan. Genuine laughter ensued when I asked leaders the question: “Did you have a master plan in place that you were following?” None of them did. While many had ideas about what was needed or general principles to which they adhered, they made decisions based on data in front of them and the context in which they operated. What might seem like a master plan in hindsight was really a series of rapid cycles of evaluation, strategic planning, and execution. 5. Build a fact base first. When we asked system leaders how they started their work, the most common answer was by building a fact base. Doing so provides a strong foundation for making internal decisions and a case for change externally. Depending on the context, the fact base might include an accurate accounting of district funds, enrollment patterns, demographic changes, or parent survey data. In every case it included school performance data. The results provided leadership teams with information they could use to identify high-performing schools that could be replicated and expanded as well as low-performing schools that required intervention or closure. Importantly, no one that we spoke to followed their gut, blindly adhered to a specific ideology, or was beholden to special interest groups. When the data changed, so did their approach. 6. Know where school autonomy stops and system-wide services start. Finding the balance between school autonomy and system-wide equity, transparency, and efficiency is a tension that all of our eight cities struggled with. In-district autonomous schools hold the promise of embodying the best of district and charter schools, yet places like Denver and Boston have struggled to relinquish control over hiring, budgeting, and curriculum to their schools. In Denver, the leaders of five district innovation schools formed the initial innovation zone after central office bureaucracy prevented them from exercising the freedoms promised to them. The balance is tenuous even in New Orleans where every school has a charter. Schools and system leaders must negotiate the factors that give schools the leeway they need to effectively educate their students while ensuring that the system is fair, transparent, and efficient. For example, in New Orleans, schools control their schedules and calendars, an autonomy school leaders see as essential to implementing a school model of their choosing. An extended-day model can’t work if all New Orleans schools must start and end their school days at the same time. A year-round model can’t work if all New Orleans schools must be open on the same 180 days. Yet the same city has a school performance framework, unified enrollment system, and common discipline policy, three functions that are better handled by the Orleans Parish School Board (OPSB) to ensure fairness, transparency, and efficiency and reduce bad actors. The compromise developed from numerous and sometimes contentious conversations. Currently, Louisiana’s Act 91 enshrines the balance between schools and OPSB in legislation that’s very difficult to change. 7. Unified enrollment is one of the few mutually beneficial strategic pillars. Unified enrollment is a system for matching students to schools of choice using an algorithm based on a community’s values. More than any other strategic pillar, unified enrollment seemed to have the most mutual benefit for parents, school leaders, and system leaders. When coupled with a good school performance framework and an accessible application, parents get good information and an easy, transparent school choice process. Unified enrollment puts low-income parents on a level playing field with the most privileged ones. Although schools give up control over their own enrollment process, the benefit of outsourcing the function to another entity allows them to redirect resources to other school needs. Additionally, schools serving all students that enroll, including disabled, special education, foster, homeless, and English language learning students, can demonstrate their commitment to equity publicly and transparently. System leaders get better demand data too. Unified enrollment systems reveal true parent preferences and a trove of data that can be used to make intelligent expansion, replication, opening, merging, and closing decisions. Despite all its benefits, there are some roadblocks to getting a universal enrollment system implemented. Districts and charters are skeptical about collaborating, especially if there’s the perception that one sector might lose market share to the other if parents have more information and an easier process for choosing. Universal enrollment also requires that some organization administer the process, whether it’s a district, another government agency, or an independent nonprofit. A lack of trust can stall progress if a neutral party can’t be agreed upon. Lastly, concerns about keeping private student data secure can derail talks even though a sophisticated system is capable of managing risk. 8. Executing accountability is the hard part. Let’s imagine a school system with a school performance framework, unified enrollment, autonomous schools with performance contracts, a talent strategy, and an office or organization in charge of system management. It would be very impressive, but without the linchpin pillar of effective oversight and accountability, the system will be different than a traditional one but not necessarily better. When leaders have to close a legacy high school or tell a community that its school has been failing students for years, it’s easier to implement an ineffective but palatable intervention or, worse yet, do nothing rather than make the difficult but necessary decisions. Check out our story on Denver to see how two board members struggled. This is typically where choice systems fall down and the engine of continuous improvement stops. 9. There are two ends of the accountability spectrum. I was struck by how different leaders with a similar strategy can diverge so widely on a core concept. On one end of the spectrum is New Orleans, where Paul Pastorek, the former state board of education member and superintendent of the Recovery School District, championed his belief of “ruthless accountability.” This approach closes the lowest performing 5% of schools every year and ensures a steady supply of better options for students to attend, keeping the system dynamic. This approach is throttled by real supply constraints in talent and high-quality school operators. On the other end of the spectrum is Paymon Rouhanifard who was the state-appointed superintendent of Camden City Schools. His approach was to depart from their school performance framework and relieve what he saw as an unrealistic timeline for improvement and school churn that destabilized the Camden community. Most other cities we studied were somewhere in the middle of Pastorek’s and Rouhanifard’s approaches. Interestingly, there were signs that New Orleans may be shifting away from “ruthless accountability” toward a more tempered approach now that OPSB trustees are publicly elected and therefore susceptible to electoral politics. 10. Some parts of the strategy are easier to undo than others. Not surprisingly, when parents are given accurate, relevant, and timely information, the ability to choose a school that’s right for their children, and an easy way to apply to them, they don’t like it when leaders take these things away. Take New York City. The massive school system saw marked improvement in student outcomes during the Bloomberg administration only to have the de Blasio administration swiftly depart from the tactics that achieved them. While the administration change stopped or reversed progress in some areas, much of what Joel Klein and his successors implemented are still in place. As we wrote, “…charter schools continued to grow, citywide high school choice persisted, many high schools remained small and theme-based, and a unified enrollment system and common charter school application helped parents make choices…” School autonomy and performance-based openings and closings have become more scarce under de Blasio’s leadership, showing that tactics that don’t affect parents directly can be reversed more easily. A change in course is a constant threat in places with elected school boards. Leaders we interviewed in Denver all expressed concern that a change in the board majority could derail progress. The threat has activated civic participation, advocacy, and crowded slates of candidates in school board elections, which are usually sleepy affairs in other cities. While not impossible, it’s difficult to imagine a new board going back to residentially assigned schools or eliminating school performance framework ratings that are embedded in every conversation about school quality in Denver. Interested learning more? Visit www.eightcities.com or email us at contactus@bellwethereducation.org to have our team host a convening, conduct an analysis, or share our lessons. 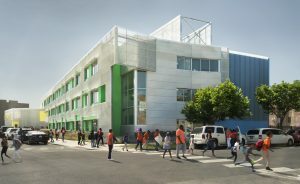 Your article, whole very informative, features a photo of our recently completed Legacy Charter School in Chicago’s North Lawndale neighborhood. I would think your credits should at least name and credit the school. It’s quite a success story in and of itself. As architect’s for the new building, we are very proud of their track record and are pleased to see them here. Great point, added a caption!